Following the success of the first Smack Doubles December 2010, Hollyburn Country Club sponsored the second Smack Doubles, February 25-27. 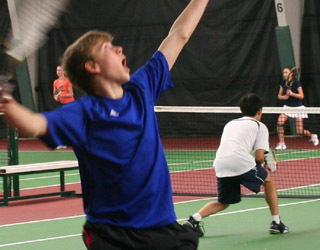 The event attracted some of the top junior players in BC. Todd Fought, above, is serving in the Boys' 18 final of the first doubles tournament of 2011. Todd and his partner, Ryan Koo went on to lose the match to James Choi and Patrick Walker, 6-3, 7-5. Photo 1 (left): From left to right: Sam Gouneili, Jack Karp, Kyryll Kryvchun, and Neel Phaterpekar. Sam and Jack mounted quite a battle against the first seeds Kyryll and Neel before losing 4-6, 6-3, 10-3 in the Boys' 14 semis. Kyryll and Neel went on to beat Isaac Davies and Jack Davis, 6-4, 7-6, in the final. Photo 2: Isaac Davies, left, and Jack Davis. Jack came here just a few months ago from Ontario. He is a new addition to the top junior players in BC. Photo 3: Alejandra Enderica, left, Stacey Fung. Alejandra and her parnter, Umang Khandelwal, the top seeds, lost to Stacey and Mackenzie Campbell, 6-3, 6-4, in the Girls' 18 semis. Photo 4: Harjit Gosal, left, and Ivana Erdevicki. Harjit and Ivana beat Stacey Fung and Mackenzie Campbell in the Girls' 18 final, in a close match, 6-3, 5-7, 10-2, to capture the title. Photo 5: James Choi, left, and Patrick Walker, winners of the Boy's 18 title. Photo 6: Patrick Walker posing with his parents, Randy and Anne. In the Girls' 14 round-robin, first place went to Khadija Dumas Da- Silva and Brooklyn Legault and second place to Carley Hunter and her partner Nina Erdevicki.